What you feed your baby is one of the most important aspects to consider. Your baby is constantly developing as they grow, and promoting healthy development will have an impact on their brains and bodies for the rest of their lives. When your baby is still young, they can’t consume hard foods, so you have to puree the food before feeding them. Creating nutritious and delicious food for your baby can be time-consuming; especially if this is the first time you have ever tried to. To make things as easy as possible, there is a complete range of baby food makers available, which give you everything you need to make healthy, wholesome and easily consumable baby food purees. But where do you start when it comes to choosing the ideal baby food maker? To give you a helping hand, I’ve chosen my favorite baby food makers that are currently available. These devices are packed with features designed to be as time-saving as possible. Not sure what you’re looking for when it comes to baby food makers? Not a problem! Scroll down to discover my step-by-step buying guide, detailing all the information you need to know to make the best purchasing decision for you and your family. Unsure what the best baby food makers currently available are? Here are my eight favorite food makers featuring everything you need to promote healthy development for your baby. 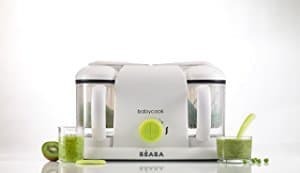 To start off my list, I’ve chosen a fantastic all-round baby food maker that’s packed full of features that will leave you wondering what you ever did without it. This compact, lightweight food maker prides itself on its built-in steaming function alongside a fully-functional blender. This allows you to soften the food before blending, helping you to create the perfect pureed food for your baby. Thanks to these functions, you can mix up all kinds of food including meat, fish, vegetables, and fruit, allowing you to create healthy, wholesome meals that your baby will love. Furthermore, the unique design allows you to operate the device with just one hand, enabling you to easily create your baby’s meals in just under 15 minutes, while holding your little one. The machine itself is designed to be as compact as possible, allowing for easy storage, while the materials used are completely BPA, phthalate, and lead-free, making sure your baby’s well-being is maintained at all times. What's Great About It: Thanks to its unique design, this baby food maker has an extremely large bowl compared to the petite design of the machine. This enables you to create large quantities of food, ideal for making batch meals. Looking for a more fully-featured baby food maker that can help you make the best food for your little one? The Cuisinart Food Maker could be ideal for you. This sleek and professionally designed blender includes all the steaming and blending functions you’ll ever need to create lump-free purees that your baby is going to love. This device prides itself on its patent-pending steel blade lock system that guarantees the safety of the product while in use. In addition to this, this machine provides you with a unique steam blade feature. This blade helps to distribute the steam around the bowl area, evenly steaming all parts of the food inside which results in a quick, more effective steaming process. The bowl itself is wide and tall, enabling you to hold up to 4 cups of food. Included with your blender, you’ll also find a special recipe booklet alongside other handy accessories that will make using the product even easier. What's Great About It: At the top of this amazing blender, you’ll find a professionally implemented bowl seal. This helps to minimize the risk of spilling when using the blender, and also assists in holding in the steam, maintaining a high level of safety. It also comes with a bottle warmer function, which is a nice bonus. 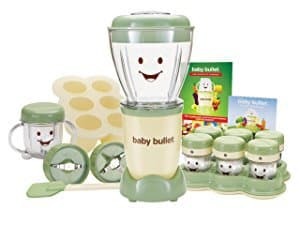 This is the ideal blender for any active parents that want to save time while providing their baby with all the nutrients and vitamins they needs, making this setup a kitchen essential. 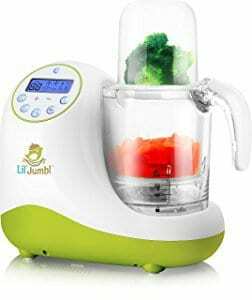 There are two main food baskets included with this blender which together offers five various functions. 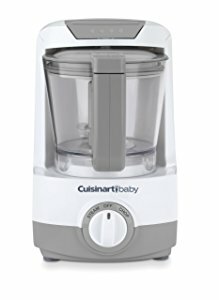 With this unique device, you can cook, warm, blend, steam and defrost your baby’s food, making this one of the most fully featured food makers on my list. Thanks to the large bowl design, you are given the ability to make up to 25 servings of food in just a couple of minutes, perfect for making batch meals, saving you time in your already busy days. Additionally, you can use the food maker to warm your baby’s milk bottles, saving you having to fork out for other appliances. All the materials used are lead and BPA-free, guaranteeing the safety of your baby’s health. What's Great About It: At the front of the machine you’ll find an extremely easy to use LED screen, enabling you to quickly and easily select the setting you want in just a matter of seconds. If you’re looking for a fully-featured, innovative baby food maker that ticks all the boxes, then you’ve come to the right place. In one secure bowl you can effortlessly steam, warm, blend, grind, mill, reheat, and bottle warm to your hearts content. Additionally, the bowl features a dual-layer setup that enables you to prepare two meals at the same time, giving you more time to spend with your family. The fully-integrated LED screen allows you to select the individual settings for each bowl. This is also perfect for customizing your settings to match your baby’s eating stage as they grow and develop over the years. This baby food maker contains a built-in timer feature and a patented bowl-lock system, ensuring the food is perfect for consumption, and your baby is safe and clean at all times. What's Great About It: In addition to all these amazing features, the powerful integrated steaming system gives you the opportunity to use this machine to warm and sterilize your baby’s milk bottles. This saves you time in washing up while guaranteeing superior hygiene levels of your baby's bottles. If you’re looking for a more affordable option, the Magic Bullet is an inexpensive baby food making solution that doesn’t compromise on quality or features. The unique streamlined design means this food maker is both compact enough for easy space-saving storage, while the bowl is large enough to produce enough food for your baby in just a couple of minutes of blending. Included with your purchase, you’ll find a selection of blending blades and durable batch trays, allowing you to easily create your baby’s meals at the beginning of the week and store them away safely until they’re needed. The batch tray system allows you to easily divide up your ingredients post-blending to mix them up how your baby likes them. This is essential for your baby’s growth and will tirelessly assist you in promoting a healthy, happy lifestyle. What's Great About It: This purchase is both affordable and is packed with essential utensils that are designed to optimize your blenders performance while helping you save time in creating the best meals possible. These utensils include storage cups, trays, customizable lids, spatulas, bowls, blades and a cookbook. Sometimes, the simpler a device is, the better. This is the exact niche that the Baby Brezza Baby Food Maker has expertly mastered. The simple, effective design enables you to simply add your ingredients to the durable, large-volume bowl, set the steaming time using the effortless control panel located on the front of the model, and the machine will do the rest. Thanks to this simple design, all aspects of the baby food making process can be completed in the same bowl, eliminating the need to transfer hot food from one bowl to another. Its compact size means that the blender can be stored anywhere. 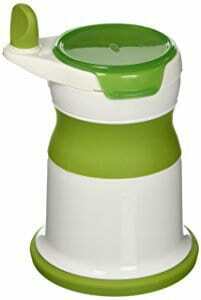 All components of this machine are BPA-free, ensuring the health and well-being of your baby. What's Great About It: To make things even more convenient, all aspects of the blender, including the bowls and blades, are completely dishwasher safe. This makes it incredibly easy to maintain the highest levels of cleanliness and hygiene when it comes to your baby food maker. The next entry of my list is from the market-leading Baby Brezza company. 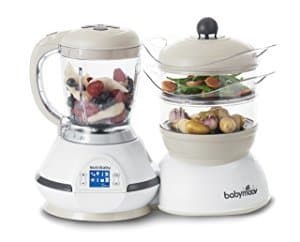 This feature packed food maker is an essential to any kitchen and guarantees to make your life easier while helping your baby receive all of the vitamins and nutrients they need. Similar to the previous maker, this high-quality blender boasts a one-step function where you can simply place the food in the large, 3-cup capacity bowl before pressing a single button to steam and blend your food automatically. Furthermore, there are three unique settings to choose from. You can simply steam, blend or do both, depending on what eating stage your baby is at, making it the perfect accompaniment as your baby grows. The entire system is incredibly easy to clean after every use, and the blade and bowls are dishwasher safe, allowing you to maintain the highest level of hygiene for your baby. 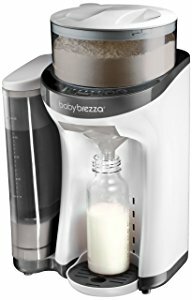 What's Great About It: In addition to its lightweight and compact design, this Baby Breeza Food Maker also comes with a collection of bags and storage pouches alongside a handy funnel which makes it easy to create batch meals for your baby to eat throughout the week when you are short on time. As you may have noticed, all the food makers above are electronically powered, but a traditional, manual food maker still does the job. One of the best manual makers currently on the market is the OXO Tot Mash Mill. This slimline, gorgeous design comes with an integrated stainless-steel blade alongside grinding plates, enabling you to effortlessly puree cooked fruits and vegetables for your baby. After you have finished grinding, you can easily scoop and serve the puree into containers, ready for storage or to instantly feed your baby. As a manual food maker, the design uses market-leading non-slip features that help the Mill stay in place when in operation, giving you all the stability you need to create the perfect meals. All the materials used to make the Mill are easy to clean thanks to their wipe-able surfaces, making it easy to maintain the highest levels of cleanliness. What's Great About It: As a manual baby food maker, this device is extremely affordable compared to other electronic brands. This makes it suitable for all budgets. It is easy to use and you can take it straight out the box and start using it straight away. Now that you know the ins and outs of some of the best baby food makers, it’s time to choose the best one for you. Not sure what you’re looking for? Whether you’re shopping online or at a local store, follow my step-by-step buying guide for everything you need to know. The first decision you’ll want to make is how you are going to process your baby’s food to make the meals. 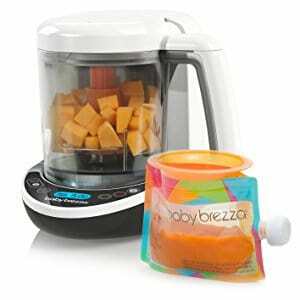 If you want an all-in-one solution, you’ll need a device that can steam the food first to soften it before blending it into a puree that is suitable for your baby. If you already steam a lot of food at home for yourself and your family, you may just want a baby food blender as the food is already steamed. Many of the mid-range to high-end electronic devices will handle everything and will come with a whole range of features, and can even include bottle warming and sterilization. If you already have these appliances, you may not need these, but if you choose an all-in-one solution, you can end up saving yourself a lot of time, space and money. You’ll also minimize the time you spend washing up separate bowls you used to use to make your baby food. Also known as ease of use, this is what most parents will look for in a baby food maker. When it is dinner time for your baby, there’s a lot going on and your attention may be divided. When it comes to baby food makers, you’ll want a device that has as few steps of operation as possible. If you’re glued to the instruction manual every day, you’ve probably chosen the wrong food maker for you. As you can see in my list above, a lot of food makers come with automatic settings. This allows you to simply put the food into the device, press a button and the machine will take care of the rest with minimal effort on your behalf. This is ideal for all parents, especially those with busy lives. As with the consideration above, time is of the essence for most parents. If you make all of your baby’s food by hand, this can take hours out of your day. When choosing a mid-range to high-end device, you can have your pureed food in a matter of minutes. The longest average time, including the steaming process, is around 15 minutes on an automatic setting. Refer to the product description of the device you’re buying to ensure that the process won’t take hours, leaving your baby hungry and you frustrated. The storage of your food maker is an essential aspect to consider. If you’re keeping your machine on your work surface, you’re going to want a food maker that looks good and fits the style of your kitchen in an uncluttered way. All the devices I’ve listed above are specially designed to look great while being functional. Alternatively, you may be looking to put your machine away after every use, especially if you’re making batch meals and won't need the machine for a few days. If this is the case, you’ll want to consider the size and the weight of your chosen machine. Some of the larger machines can reach weights of over nine pounds, making it difficult to put away. Always consult the product description for the exact weight of the product. Integrated into baby food makers, there are several potentially harmful elements, the main ones including the hot steam and the fast spinning blades. Always look for a device that has an integrated lock feature. This will ensure the steam of the machine is held within the bowl area of your food maker and won't escape, increasing the potential of somebody being burnt. Additionally, the more steam that is held inside the bowl, the quicker the food will soften and therefore the quicker your results. Likewise, you’ll want to look into what materials are used in the production of your food maker. Harmful plastics used in traditional food makers may contain BPA chemicals that can transfer into your child’s food. These have been proven to disturb the hormonal balance of children that can lead to problems in development later in life. Always check the label to ensure your blender is free from these chemicals. If this is a big concern of yours, look for food makers that contain stainless-steel blades and glass bowls. Choosing the right baby food maker for you can be a big step in a direction that will change your life. Not only will you save time and money with your purchase, but you can also enjoy the added benefits of a professional food maker that makes healthier meals for your baby. By giving your baby the right meals, you are actively promoting a healthy and happy life that will stick with them throughout their lifetime.